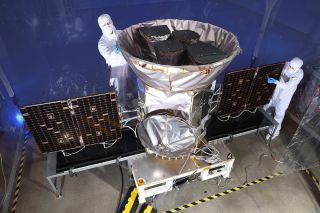 NASA's Transiting Exoplanet Survey Satellite (TESS) is compact but mighty, with a body just 5 feet (1.5 meters) wide. This planet hunter may end up discovering more alien worlds than NASA's famous Kepler space telescope. NASA's next planet-hunting telescope will swing its gaze from point to point in the sky, searching for worlds that could be habitable. The telescope, known as the Transiting Exoplanet Survey Satellite (TESS), will launch no earlier than Monday (April 16). Its ultimate goal is to provide a catalog of planets all over the sky. Then, even more-advanced missions can gaze at these worlds to learn more about their atmospheres. TESS is likely too small to get very much detail from a planet, but it can act as a finder scope and pave the way for more advanced observatories. A key follow-on telescope will be NASA's James Webb Space Telescope, whose launch was recently pushed to 2020. One of Webb's science goals is to better characterize the atmospheres of planets. Ideally, this will include potentially habitable planets — rocky worlds that orbit their star at a distance where water can exist on their surfaces. Researchers will attempt to use TESS to identify about 50 worlds that are less than four times Earth's diameter. They hope at least a few of those planets will be in the habitable zone of their stars; if TESS achieves this goal, these worlds would add to a noteworthy catalog of nearby planet-hosting stars, including Proxima Centauri, which is just 4 light-years from Earth, and TRAPPIST-1. TESS should also find a few hundred worlds of all sorts, ranging from hot Jupiters (gas giants close to their star) to super-Earths, or worlds that are between the size of Earth and Neptune. To find such planets, "we're going to focus on M dwarfs," Ricker said, referring to stars that are a little cooler and dimmer than our own sun. Potentially habitable planets must orbit closer to the star to get enough warmth, which means they will pass more frequently across their parent star's face. More transits mean there is a better chance that TESS will see the planet in its 27-day examination of a particular part of the sky. "The advantage is that M dwarfs are about half the size of the sun," Ricker added, "and if you have a planet that is four times the size of the Earth, you get an [advantage] from the fact that the host star is smaller." Those planets are easier to spot because they dim the host star more than they would around a larger star, he said. And there's another advantage, he noted. M dwarfs typically emit light with a wavelength of around 1 micron, which means that they are very visible in the infrared. This is the perfect spectrum for Webb, which is optimized for observations in that wavelength. This was a deliberate part of the mission design. "We wanted to find targets that are going to be optimized for follow-up observations with either existing resources on the ground or near-term space resources like [the] Hubble [Space Telescope] or Webb," Ricker said. Investigators hope to operate TESS for longer than its planned two-year mission, especially so that its observations will overlap with Webb's. A more ambitious goal would be to have TESS and the European Space Agency's Planetary Transits and Oscillations of Stars (PLATO) observatory operate at the same time, since PLATO isn't launching until 2026. But Ricker said the engineers tried to keep consumables to a minimum; the TESS orbit will use minimal fuel, and other components of the spacecraft are built to last several years.